(1) Any person who knowingly seizes and carries any person from one place to another, without his consent and without lawful justification, commits second degree kidnapping. (2) Any person who takes, entices, or decoys away any child not his own under the age of eighteen years with intent to keep or conceal the child from his parent or guardian or with intent to sell, trade, or barter such child for consideration commits second degree kidnapping. (b) The person kidnapped is a victim of a robbery. (III The kidnapping is accomplished by the perpetrator representing verbally or otherwise that he or she is armed with a deadly weapon. 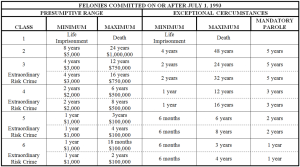 (b A defendant convicted of second degree kidnapping committed under any of the circumstances set forth in this subsection (4) shall be sentenced by the court in accordance with the provisions of section 18-1.3-406. 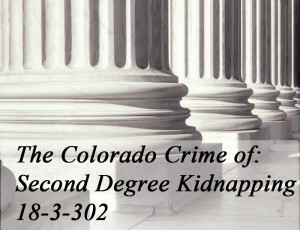 (5) Second degree kidnapping is a class 4 felony, except as provided in subsections (3) and (4) of this section.